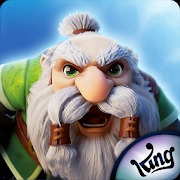 Legend of Solgard is a Match 3 puzzle games developed by King, which is well known for developing puzzle games. Legend of Solgard is their new game which combine match three puzzle games with SRPG. In this unique RPG, combat enemies and bosses with the creatures you collect, level up your hero powers and loot treasure from Norse legend! Join Embla in her epic fight to stop the end of all worlds and establish her as one of Solgard’s most powerful heroes. Use strategy to battle hordes of ice enemies in the Hero Arena, claim bounties on legendary villains, defeat epic Bosses and win the war against evil to become a true legend of Solgard. This post will guide you Download and Play Legend of Solgard on PC with MEmu App Player. Click to watch how to play Legend of Solgardon PC.. I recommend playing Legend of Solgard on PC using MEmu Player. If you haven’t download MEmu yet, please install it here. Once installed, you will see it on your home screen list of apps. Just simply open it and the first launch will begin to download game resources. Once it completed, you will able to play Legend of Solgard on your computer!